Camped at Nauvoo State Park in Illinois. Torrential downpour during the night but the tent held tight. Only all the stuff we'd left out and in the case on top of the car that we didn't close got wet. Nauvoo is the last Eastern outpost for the Mormons. It was from here that they made their way to Utah. Taking the car ferry across the Mississippi from Illinois to Canton, Missouri just to say we did. It's run by a local farm co-op and cost $5 for a one-way trip. So we're zipping along a road in Illinois? Indiana? Iowa? (one of those I-states) and Terry says, "Hey did you see those pigs?" Heather replies, "I've never seen pigs up close." "Really!!" says Terry as he slams on the breaks and prepares to turn around. There was a farm on the other side of the road from the pigs and a farmer had just come outside. Terry drove up to him and asked if the pigs were his. "Would you mind if we went to take a look at them?" asked Terry. The farmer scratches his head and says, "No, I guess." "My wife just said she'd never seen a pig up close before," explained Terry. "Really!!" exclaimed the farmer. "Where are you from?" That seemed to make sense to the farmer so across the road we went. He suggested that we not try to pet them....we didn't. 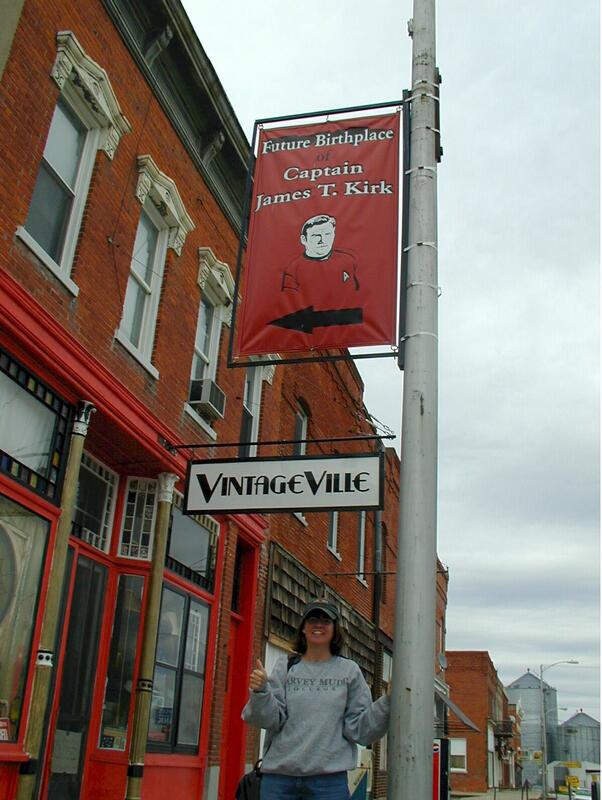 More intriguing small red print in our road atlas found us off our path and in Riverside, Iowa, the future birthplace of Captain James T. Kirk. Hallowed ground for Star Trek fans! They host a festival every summer and William Shatner has been there twice.